Both skill and art are needed to turn an interview into an opportunity. But preparation may be the biggest determination of success at converting an interview into a job, an internship or an important career move. Be yourself. Pretending to be someone or something you are not ends up being a lose-lose situation, even if you land the job or internship. However, being yourself does not mean “wing it.” To get a job or internship offer, you need to be the best you that you can be. Research the position. Ask for a description of the position and thoroughly research it. Determine the key qualifications for the position (skills, experience, etc.). Prepare examples from your experiences that demonstrate you have those key skills and qualifications. Research their website. Know what they do (services or products) in as much detail as possible. Know their mission statement. What do they stand for? What are their values? Know enough about them to answer “Why do you want to work for us?” with specifics and enthusiasm. Look at the “What’s new/Press room/release” section of their website. Incorporating this information into one of your answers or questions can be a great way to impress them. Be able to answer the following: Tell me about yourself. Why are you interested in this position? Why do you want to work for our organization? What are your strengths and weaknesses? What are your short- and long-term goals? Give me an example of a time you demonstrated _____ (key job skills/qualifications). Back up your answers with specific examples of what you have done. General or vague answers are a common mistake. Don’t just say “I think a good example of my leadership skills would be my involvement in the management club.” Cite at least one example of how you used your leadership skills for the management club. Create one- to two-minute stories using SAR: Describe Situation, your Actions and cite Results. Have questions prepared to ask them based on your research and/or things they have mentioned during the interview. Practice your answers. More practice translates into a higher success rate. The more often you answer interview questions, the better your answers usually get. Using actual interviews to polish your answers is a good way to not get job offers. Dress appropriately. For almost all job or internship interviews, this means wearing a business suit and dress shoes. Send a thank you note by the next day. A short, handwritten note will make you really stand out, but an emailed note will get there quicker and is perfectly acceptable. Willingness to start at the bottom. Professional knowledge, insight and perspective. Work experience or student teaching experience. Physical, mental and social maturity. Articulation and command of English. Ability to relate to others. In today's mostly conservative job market in which companies might interview dozens of people for one position, first impressions are more important than ever. Grooming, body language and dress from head to toe matter. Try not to be remembered for your attire. Wear something that allows the interviewer to focus on your skills and qualifications rather than your style. Your garments and accessories should convey a professional polished look. Men should wear a suit or dress pants with a button up shirt and tie. Check out this how-to-tie-a-tie demonstration. Women have more choices, but it’s important to remember to stick to the basics. Choose a top with sleeves and a higher neck line. Scoop or V-neck shirts are not interview-appropriate. When picking bottoms, dress pants or a skirt that falls just below or above the knee are most appropriate. When wearing a dress, make sure it is a modest length. In some cultures women may dress in a more traditional sense. It is important to keep this value when dressing for interviews, but it is also important to maintain a clean, crisp and professional look. Tops: In some cultures it is custom that women stay covered and concealed. In this situation, opt for blouses with a high neck line or collared shirt, paired with a suit jacket. Bottoms: In some cultures it is not recommended that women wear pants or a pant suit. Instead, floor length skirts/dresses are a good alternative. Hijab/Headscarf: If it is custom in your culture to wear a hijab or headscarf, remain neutral in your color choice with minimal to no pattern. Choose solids over patterns. Wearing solid colors helps ensure that your clothes will not distract. Small patterns, like thin pinstripes, are OK. The rule of thumb is to select a pattern that is small enough that it looks like a solid from across a room. Choose neutral over bright colors. Navy, gray, black and brown are the best for a job interview. White is also an excellent color for a blouse or button-down shirt. Tan — This neutral color evokes feelings of calm. It is a great solid, neutral color for any interview. Blues — They convey feelings of calm, trust, and confidence, which are great qualities for an interviewer to sense in you. Darker blues (like navy) convey authority and confidence. Gray — It evokes sophistication and neutrality. Gray is a great color to wear as a suit or dress. It allows you to look powerful, but is not quite as domineering as a black suit or dress. Black — This is a good color for a job in a conservative environment like a law office, or for an interviewee applying for a high-level executive position. However, black can be a bit overwhelming in a more laid-back office environment, and can make you appear unapproachable. Red — This bright, powerful color conveys energy and passion. A pop of red (a scarf or tie) can convey just the right amount of passion without making you appear too emotional. *Only when interviewing for high level leadership positions. White — Crisp and clean, white is a great color for shirts and blouses. The color conveys truth and simplicity, and adds a bit of brightness without being too overwhelming. Pop of color — You can certainly a bit of color to a neutral outfit. However, limit the number to one, and make sure it is not the dominant color of your outfit. Men should wear a nice pair of dress shoes in a dark, neutral color, matching the belt. For women it is important to stay modest. Choose a closed-toe shoe with a low heel in a neutral color. When choosing accessories it is important to remain minimal. Try adding a pocket square, necklace or bracelet to add a little flair and personal style to your outfit. One or two pieces of jewelry is plenty. Avoid bulky or flashy pieces that will distract from your outfit instead of complement it. The interview is the most efficient way for you and the representative of an employer to get to know each other. However, research and preparation will significantly increase your interviewing performance and positive outcome. You cannot exactly rehearse your role in an upcoming interview because you don’t know what cues will be given to you. Common courtesy, good common sense and being yourself is always encouraged. While there is no single correct way to conduct an interview, these are some basic rules and situations common to most interviews. Prepare your résumé and cover letter. Do your homework. Research the employer with whom you are interviewing. Know the salary range and commit your interest. Match your goals and needs with those of the employer. It is important to know the background of the organization as you may wish to ask questions. Also, learn the interviewer’s name. Develop your agenda. List what skills you have to offer. Know your strengths and weaknesses. Be rested and think positive thoughts. Dress in good taste. While many employers encourage individuality, let basic good taste determine how you dress for an interview. Head to foot cleanliness and neatness also will help to create a good first impression. Nervousness: It is normal for many people to be nervous, particularly in an interview. It does help to dry a damp brow or a clammy hand just before meeting your interviewer. Experienced interviewers discount a certain amount of nervousness. Be yourself. Remember that the interviewer wants to get to know something about you, not hear a memorized speech. Be on time. Try to be 10 to 15 minutes early. Call if you will be delayed. Be prepared. There are ways in which you can help to prepare yourself for interviewing. Your college Career Center is experienced in acquainting students with basic interviewing techniques. Realize the importance of the first three minutes. This is where you will make your first impression. Smile and greet the interviewer by name if you are sure of the pronunciation as you enter their office. Take your cues from them. If they move to shake hands, do so but not unless they make the first gesture. If they shake hands with you, use a firm grip –a “limp fish” handshake will make a bad impression. However, do not try to prove how strong your grip is by mashing it. Wait until they offer you a chair before you sit down, unless, in a very small room they remain seated or sit down immediately. Do not chew gum or smoke. Be aware of body language. Sit up in your chair and look alert and interested at all times. Lean forward to show interest. Do not look tense, but do not relax so much that you slouch. Show that you can be a wide-awake, intelligent listener as well as a talker. Do not let your hands betray nervousness. If you do not know where to put them, leave them in your lap and keep them still. The interviewer may ask you if you always pitch right into an assignment and get it done ahead of time. You answer, “I am afraid I do not always get assignments done before they are due. I sometimes have a tendency to put a thing off until it has to be done. However, I never turned in a major assignment or term paper that was late. And I am sure that the supervisors I have had in my last two jobs (I’ve listed them among my references) will be glad to tell you that my work for them was always finished on time. Both of them told me that my work was thorough and very accurate, and both asked me to return to the job the following summer.” Score one for frankness and three for responsibility, accuracy and giving satisfaction in previous jobs. Be ready for at least one surprise question. Some favorites: What can I do for you? Tell me about yourself. Why are you interested in this organization? If you think those are easy questions to answer without some previous thought, just try it. Preparation counts. If they want to know what they can do for you, tell them that you would like to apply for a job or internship in a certain function of their company, with an idea toward progressing into some more advanced phase — or say anything that will show them you are interested in progress with this employer. Be as specific as you can. Suppose they ask you to talk about yourself. If you are wise, you have thought, “If I were in this place, working for this organization, what would I like to know about an applicant?” Tell those things about yourself that relate to the situation, your background, your education and your skills. Be informative without boasting, and avoid sounding like you have prepared a speech. As for the third question, if you have studied the organization's literature you will not be at a loss for words. Be ready for the favorite questions, “What do you plan to be doing 10 years from now?” or “How much money do you expect to be earning in 10 years?” The questions show your ambition, your ability to plan ahead and the soundness of your thinking. If you are asked if you have ever been fired — and you have been — frankness is the answer. Tell them you have learned from your mistakes. Also, there is the possibility you got into a wrong job through a misunderstanding. Use frequent, direct eye contact with the interviewer, especially when responding to questions. Look pleasant and smile at appropriate occasions. Emphasize your strengths. Make sure that your good points get across to the interviewer — they will not know unless you tell them. Mention your best qualities in relation to something concrete. Try to appear factual and sincere, not bloated with conceit. Emphasizing your goals and strong points may alert an interviewer to an attribute that did not show up on your résumé. Never sleight a former employer or professor. If something went wrong, suggest that at least some of the blame must have been your own. Do not take notes if you can help it. It is annoying and distracting. If you must write something down, offer: “That is very interesting. Do you mind if I make a note of it?” The best policy is to make note on paper immediately after the interview everything you want to be sure to remember. Some interviewers hardly speak and expect you to sell yourself. For an amateur, these are hard. You will have to call on knowledge of yourself and your interests in the work their company does. However, stick to the subject at hand. Do not go off on a tangent. The interviewer may steer the conversation into politics or economics. Be honest, and do not be evasive, but try not to say more than is necessary to answer the recruiter’s questions. If you can agree with them, fine. If you stray off into talking about your pet enthusiasms, you may hang yourself. Conduct yourself as if you are determined to get the job or internship you are discussing. The recruiter is aware that you may have other opportunities, but they want to think that you would like to work with their company. Try to avoid the impression that you have come in to look over possibilities, and that you are not sure what you want. Do not say, “I’ll do anything if I am given the chance to learn,” or “I do not know what I want to do. I hope you can suggest something.” When possible, apply for a specific job or field of work. If there is no opening in the area you suggest, the way you present yourself may lead the interviewer to suggest another job or department, perhaps, better than the one you were seeking. For this reason, it is not advisable to get too far out on a limb by saying you will not consider anything but one certain job. If the courses you took have not led you into preparation for a specific field of work, don’t pass up chances for interviews. Researching the organization will better help you present your broad qualities in light of the company’s needs. If the employer has a training program you will naturally want to express interest in it. Show the interviewer that you are interested; realize the demands on their time and that you appreciate the opportunity they are giving you to present your case. Show your interest by asking some questions about the company. Ask about opportunity, not security. Have two or three good reasons you’re interested in this particular employer. The chances are excellent that you will be asked for your reasons. If you get the impression that the interview is not going well and that you have already been rejected, do not let your discouragement show. You have nothing to lose by continuing the appearance of confidence and you may gain much. Sometimes an interviewer who is genuinely interested in your possibilities may seem to discourage you to test your reaction. What if they offer you the job or internship on the spot? If you are absolutely sure it is the one you want, accept with a definite yes. If you have the slightest doubt, ask for time to think it over. Trying to set a date when you can answer will reassure them that you are seriously considering their offer. You also may have the opportunity to arrange a trip to the plant or office. (If you are invited to make such a visit at an employer’s expense, your expense sheet should include only costs actually relating to your trip, such as transportation, meals, housing and tips. Costs should be prorated among employers if you visit several on the same trip.) Above all, do not create the impression that you are playing one company against the other to drive up the bidding. Do not make appointments in which you are really not interested, and avoid accepting more than one offer. You will find yourself in an extremely awkward position and you stand to lose the confidence of everyone involved. If you have accepted one job or internship and a chance turns up suddenly to interview for a really irresistible position, turn to your career counselor for advice. Breaking job engagements is possible, but the way it is done is important. Salary??? Where most college interviews are concerned, the company representative has arrived on campus with a certain number of jobs to be filled in definite salary brackets. The interviewer may choose not to tell you what he or she has to offer. They may ask you how much you want. The best answer in that case is to indicate that you are more interested in a job where you can prove yourself than you are in a specific salary. There is a tendency to overrate the importance of starting salary. It is the job and what goes into it that determines an employee’s salary. It is easier to raise a salary than it is to justify a salary that proves too high for the experience and ability demonstrated. If the interviewer is interested, they will generally suggest a figure. In most cases, reputable corporations will offer the standard salary for the type of job in question. It is in your interest to have found out what the rate is. The Career Center can tell you what the normal range of starting rates is for a person with your background. Do not be too discouraged if no definite offer is made or no specific salary is discussed. The recruiter will probably wish to communicate with the office first or interview more applicants before making any offers. Most interviews last 30-60 minutes. Glance at your watch and be alert to signs from the interviewer that the session is up. Why are you interested in their company? Employers find phone or video interviewing an affordable and effective screening tool. They are frequently used to save time by pre-qualifying your interest and expertise. It may be your first or only chance to make a good impression. You call the hiring manager. An employer calls you from a resume referral or from your posting on their website or an internet job board. The company schedules a pre-set time with a hiring representative. You must be ready to have a professional interaction every time the phone rings if you are looking for an internship or a job. Record a refined and simple voicemail message, but also teach whoever might answer your phone how to respond to a professional caller and how to take an accurate message. Plan for a phone interview in the same serious, focused way you do for a face-to-face meeting. You do your research and have your points ready to prove that you fit the qualifications and will add value to the company. What are your compensation requirements? Phone interviews are concise, focused and last generally 20-30 minutes. Be prepared to spend the necessary time. Have a “do-not-disturb” sign on the door. Make sure the room is quiet. Turn off your TV, stereo and cell phone. Turn off call waiting on your conventional and/or cell phone. Make sure that your cordless phone is fully charged. Tape your resume to the wall in front of you for easy reference. Have the company information and your research notes in front of you. Have a pen and paper handy for taking notes. Stand up, but do not pace. You will sound better. Smile as you would face-to-face. You will come across friendlier and more interested. Speak naturally and calmly. Try to match the interviewer’s pace and pitch. Ask for accommodations if you need them — relay service or TTY are often available for people who are deaf or hard of hearing. At the conclusion of the phone interview, ask the interviewer about the next steps and timing of the hiring process. Follow-up the phone interview with a thank you letter. Most interviewers will follow a simple question and answer format. However, be ready for a few unexpected questions. Some interviewers have a favorite or two they like to spring, such as: "What can I do for you?" "Why are you interested in working for us?" or... "Tell me about yourself." When answering, be sincere, honest and concise. Interviewers frequently ask these questions. What are your long range and short range goals and objectives, when and why did you establish these goals and how are you preparing yourself to achieve them? What specific goals, other than those related to your occupation, have you established for yourself for the next 10 years? What do you see yourself doing five or 10 years from now? What are your future plans? What do you really want to do in life? What are your long range career objectives? How do you plan to achieve your career goals? What are the most important rewards you expect in your business or teaching career? What do you expect to be earning in five years? Why did you choose the career for which you are preparing? Which is more important to you, the money or the type of job? What do you consider to be your greatest strengths and weaknesses? How do you think a friend or professor who knows you well would describe you? What motivates you to put forth your greatest effort? How has your college experience prepared you for a business or teaching career? What qualifications do you have that make you think that you will be successful in business or teaching? How do you determine or evaluate success? What do you think it takes to be successful in an organization like ours? In what ways do you think you can make a contribution to our organization? What qualities should a successful manager possess? Describe the relationship that should exist between a supervisor and those reporting to him or her. What two or three accomplishments have given you the most satisfaction? Why? Describe your most rewarding college experience. If you were hiring for this position, what qualities would you look for? Why did you select your college or university? What led you to choose your field of major study? What college subjects did you like best? Why? What college subjects did you like least? Why? If you could do so, how would you plan your academic study differently? Why? What changes would you make in your college or university? Why? Do you have plans for continued study? An advanced degree? Do you think that your grades are a good indication of your academic achievement? What have you learned from participation in extra-curricular activities? In what kind of a work environment are you most comfortable? How do you work under pressure? In what part-time or summer jobs have you been most interested? Why? How would you describe the ideal job for you following graduation? Why did you decide to seek a position with this organization? What two or three things are most important to you in your job? Are you seeking employment in an organization of a certain size? Why? What criteria are you using to evaluate the organization for which you hope to work? Do you have a geographical preference? Why? Will you relocate? Does relocation bother you? Are you willing to travel? Have you traveled? Are you willing to spend at least six months as a trainee? Why do you think you might like to live in the community in which our company is located? What major problem have you encountered and how did you deal with it? What are your interests? Hobbies? What do you like to do in your leisure time? What are your personal goals? What experience have you had? How is your previous experience applicable to the work we do here? Why are you in this field? Why did you leave your former job? Is there someone we can contact who is familiar with your activities? Where do you see yourself in this company 10 years from now? Are you applying to other companies? What kind of compensation are you looking for? What positions of leadership have you held? How did you finance your education? What skills do you possess? It's important to be prepared to answer questions about your methods for teaching, discipline principles and personal development. What qualifications do you have that suit you for teaching? What are the disadvantages of the field you have chosen? What do you know about our district? What sort of principal would you like to work for? Why? Tell me how you think children learn best? What type of environment do you prefer to teach in? What is the most important thing you have learned from your previous job? What sort of teachers would you choose to work with? What have you done that shows willingness to work (creativeness, initiative, etc.)? Are you willing to advocate for your students even if it displeases your superiors? Which of your teachers had the greatest influence on you? At what age did you first decide you were interested in education? What kinds of books and magazines do you read? How often do you expect to attend voluntary school functions? Do you think you have done the best work you are capable of? Describe how you motivate reluctant learners. Have you had experience with cooperative learning? How would you grade a student with exceptional educational needs who is working in a regular classroom? Please tell me about your favorite lesson to teach. If you had a student who was wandering around the class, talking loudly, and refusing to take his seat, what would you do? Whose job is it to handle discipline in the schools? What have you found to be the most effective teaching method for you? How will you deal with the multicultural aspects of this community if you teach in this school system? Describe your position regarding failing students vs. retaining students. How do you propose to remain current as a teacher? Please tell me about the most rewarding thing that has happened to you as a teacher in the classroom. What long-range goals have you set for yourself? What is your greatest strength in the classroom? Tell me your experience with team teaching. Be prepared to ask questions at your interview. This allows you to determine if you would be satisfied with this position. It emphasizes that the job interview is a two-way process set up to establish a mutually satisfying work relationship (for you and the employer). Do not ask basic questions about the employer (these should be known through your research), instead, inquire about specifics. Would you describe the duties of the job? Could I see a more detailed job description? What is a typical day like in this position? What characteristics do you most like to find in people in this position? Is there anything unusually demanding about the job I should know about? Could you tell me about the primary people I would be dealing with? What would be the working relationship with my supervisor? What are the primary results you would like to see me produce? Did the person who last held this job promote out of the position? May I meet some of the staff I would be working with? Can you tell me the prospects for advancement beyond this level? How frequently does this occur? What type of training program does your organization have? Advice on job selection tests a potential employer may require including practice tests. Follow up on any further contact your interviewer suggested. Follow their instructions exactly. Sending a thank you is highly recommended. Learn more about thank you letters. If the interviewer seemed really interested in you or indicated that you would hear from them — and you don't hear — wait about a week and write a brief note to remind them of your talk. Express appreciation and explain in as few words as possible your continuing interest in their company. You have little to lose at this point by refreshing their memory. Keep in contact. If you do not get a flat rejection or the polite “no” expressed in the type of letter that says, “We will keep your letter in our files and let you know if anything...” and there is still some suggestion that you should keep in touch, by all means keep in touch. Unless you make a nuisance of yourself, you will stay in the foreground if a vacancy appears. Accept only one job or internship offer. Contact the Career Center if problems arise in this area. As other questions or problems arise, take them to your Career Center. Counselors work with all types of business, governmental, educational and other organizations, and they can be of great help to you. Notify them when you take a job or change your job. Keep active. If you do not “connect” immediately, remember that interviewers, companies and jobs differ greatly. You will learn much from your first interview and you will almost certainly do better in succeeding ones. The important thing is to keep trying. Allows you to gain valuable information about a field of interest or a particular business in a comfortable, no pressure atmosphere. Provides you with an excellent opportunity to establish a network of contacts that could lead to future employment. Analyze your skills and interests. Our assessment tools can help you discover your key skills and interests. Research the world of work. We have information on hundreds of career fields and job titles. You can select and research occupations that fit your interests. Identify knowledgeable career professionals in your targeted job, career or organization. Examine your resources, including personal, family, school and business contacts, to develop a list of people you can call for an informational interview. Contact the person and tell them that you are interested in their career field and would like to meet with them to discuss opportunities in this field. Make sure they know that you are not asking for a job interview. Be resourceful, sincere and show genuine interest in what your target person does. Explain that the meeting will be no longer than 30 minutes. People usually enjoy the opportunity to discuss their work. Suggest a meeting over lunch or after work if they are too busy during office hours. If a person cannot meet, ask if you can ask them a few quick questions over the telephone. Find out exactly how many minutes you can have. If they cannot talk, ask them for the names of others you might contact in the field. Thoroughly research the organization. Study annual reports, brochures and other materials. Talk to people acquainted with the organization. Bring your resume. Have a career counselor or peer career advisor review it first. 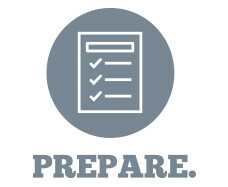 Prepare and rehearse a list of questions. Focus on your purpose — to acquire information. It is OK, at appropriate times, to share your strengths and interests, but be subtle. Ask if your contact can refer you to others in the same career. It will help you establish a referral list and build a job search network. Thank you letter. Write one. Follow up. Keep a record of each organization. Contact the referrals and interview them. What do you do during a typical work day/week? What skills are most essential for effectiveness in this job? What are the most important parts of the job? What are the most difficult or challenging elements to the job? What are the most rewarding aspects of the job? What do you enjoy least? Does the job have a high burn-out rate? What kind of training or experience is required for entry into this career field? How does one go about getting experience in this field before and/or after college graduation? How much do employers value internships? Volunteer work? Summer jobs? Unrelated work experience? If you were hiring someone today, which of these factors would be most important and why? Specific major or degree level. Knowledge of your organization, department or job. What types of employers hire people for your line of work? Where are they located? How do people find out about these jobs? What professional associations are there for this career field? Do you belong to any? How does one advance in this field? What is the turnover rate like? How much do salaries vary in your work by employer, geographic region or industry? What is the salary range for a person with my background? Do many people in your line of work accept positions abroad? Is this considered a good career move? What kinds of non-salary benefits are common in this type of work (high job security, health benefits, sick leave, vacation time, profit sharing, retirement plans, child care, etc.)? How rapidly is your present career field growing? Is the growth greater in certain industries or geographic areas? How would you describe or estimate future prospects? Where will the jobs be in five or ten years? If the work you do was suddenly eliminated, are there related career areas that you could pursue? How far can a person go in your career area? What is the career track like? Do people in certain areas advance faster? What kind of obligations does your work place upon you, outside of the ordinary work week? How much flexibility do you have in terms of dress, work hours, vacation schedule, place of residence, etc? Does your company offer flex or comp time? Day care? Is relocation necessary? Does the company help with relocation? What is the corporation culture like here? Which firms do you feel are your biggest competitors? How are those companies different from this one? Do you enjoy working for this company? How well suited is my background for this type of work? What do I need to do to become competitive? What kind of experiences, paid employment or otherwise, would you most strongly recommend? If you were back in college and had to prepare all over again, what would you do differently? Based on our conversation today, what other people do you believe I should talk to? Can you name a few people who might be willing to see me? May I have permission to use your name when I tell them how I got their name?